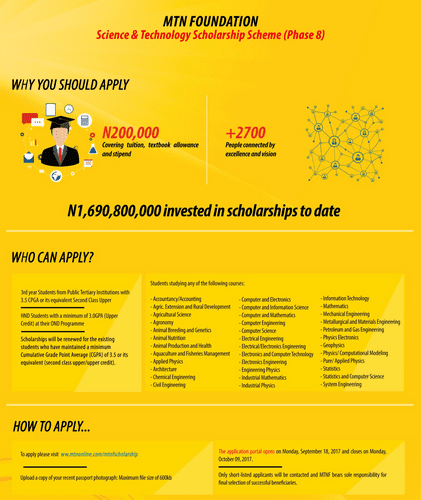 Home Nigeria MTN Foundation Science & Technology Scholarships Scheme 2017 for young Nigerians. Hi Malami, Medicine and surgery students are not eligible to apply for Mtn Foundation . Comment: Pls MTN should add the Medical courses and Education. It isnt fair for us, we ar all using MTN line for God’s Sake. Pls how do I rectify a mistake made during registration? I have won a couple of scholarships in Nigeria because of the quality of information I got here! Kudos great Admins, we students are indebted to you!